When talking about metal cutting, there are so many ways on completing this task. Some are crude as hack saws and some are designed simple while others are more technical such as plasma and laser cutting tools. Of course, we can expect a downside to every metal cutting technology and product. These can be anything from heat causing deformities together with cut line to a rough mess edge left all over. Not only that, some things can and can’t be cut regardless of what methods are used and this is where water jet cutting is put into use. The said method provides countless of benefits which will be explained in the next paragraphs. Number 1. 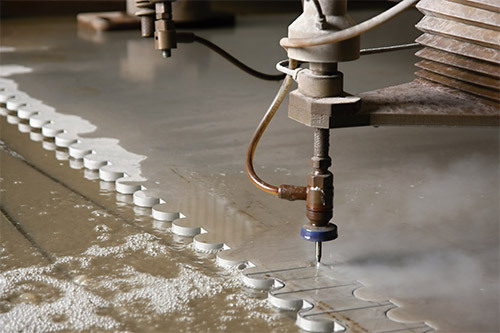 No heat – the number one difference of water jet cutting than other methods is that, it doesn’t create heat. What this mean is that, there’s no warping, distorting or melting along edges which help in making a more precise cut especially for complicated parts. Number 2. Precision – if you seek for high precision, then this is something that you should consider. Whether you believe it or not, this particular technology has a tolerance of 0.005″ when cutting. But of course, you should know that this doesn’t come cheap since higher precision translates to higher set up cost of cutter and materials needed to execute the cut. But the great news is it’s doable. The cut is no doubt precise for everything is done automatically via computer installed with specialized software. Number 3. Versatility – there are just countless of methods that work perfectly for different materials but it does not with others. Almost any materials could be cut effectively using water jet cutting. A well known exception is the tempered glass and it is likely that there are several specialized materials it would not work with. A few materials that it could cut with high precision are steels, all kinds of marble, wood, composites, aluminum, plastics and rubber. Number 4. Clean up and time – also a great benefit of utilizing this cutting technology is cleanup. There is almost no reason to do cleanup or even secondary finishing operation like sanding or grinding for the fact that there is little to no burr or slag on parts. This made the cut to move quicker and lets the job done faster compared to other cutting techniques. Other known benefits of using water jet cutting methods are fast turnaround time from drawing board to cutting the product, structural properties of materials aren’t affected as it’s cold cutting, quick setup time and high speed for faster completion of the job. Why not learn more about Girl?